Having to pre-book dinner at least a week in advance for Michelin starred places can sometimes be a pain, especially if you get that sudden pang for posh nosh. However, I’ve found that if you are willing to have dinner late enough (i.e. 930pm onwards) as we did at Wild Honey a few months back, you can get a table at most places at very short notice. 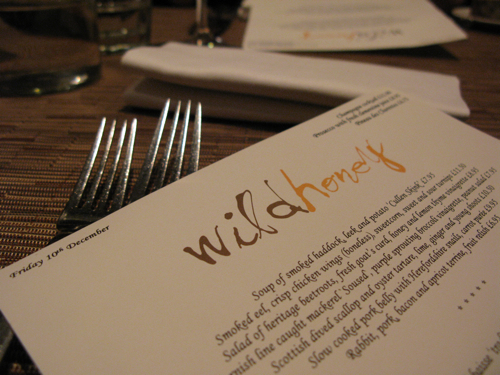 After a less than memorable meal at sister restaurant Arbutus in ’09, I was a little apprehensive as to whether Wild Honey would be able to live up to its 1-star billing. Although the newer of the two restaurants, Wild Honey seems very much the elder statesman – its Mayfair location, old-world wooden floor boards and velvet-felt chairs give it a refined elegance compared to its more contemporary, Soho-based sister. Thankfully, everything was on song from the get go this time. The menu was a mouth-watering dream… every single item screamed out, wanting to be eaten. I also love their concise, but varied wine list here which features some of my absolute favourites from all across the globe such as Piedmont’s Gavi di Gavi and Austria’s Grüner Veltliner. Best of all, everything is served up in 250ml carafes which are not only great value, but allow diners the chance to sample several different varieties through the course of the evening. I imagine I would have been very happy with any of their starters, but one dish did shout out a little louder than the rest. 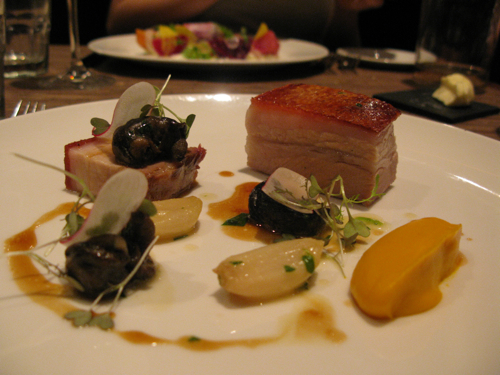 The Pork Belly with Snails was right up my street. The Belly Pork had some of the crispest crackling I’ve ever had and the meat melted in the mouth like velvet. Dee-licious with the earthy Herefordshire snails, smoky slow-roasted garlic and sweet carrot puree. Jo had fond memories of the Heritage Beet-Root Salad we had in Arbutus (one of the few dishes we did actually remember) and hence ordered Wild Honey’s slightly different version which was paired with Goat’s Curd and a well-balanced lemon thyme vinaigrette. 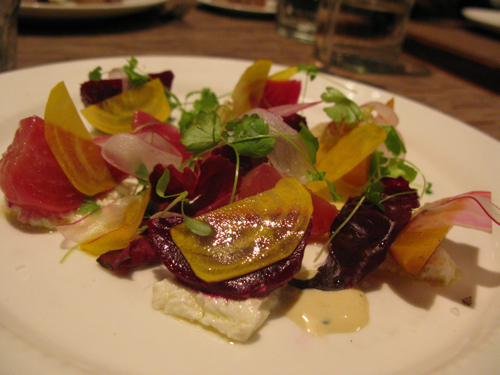 The goat’s curd had a sharp-savoury milkiness which complemented the natural sweetness of the beets perfectly. Wonderfully fresh and as beautiful as a meadow, it was as Arbutus’ version was – a stellar dish in tastes and textures. 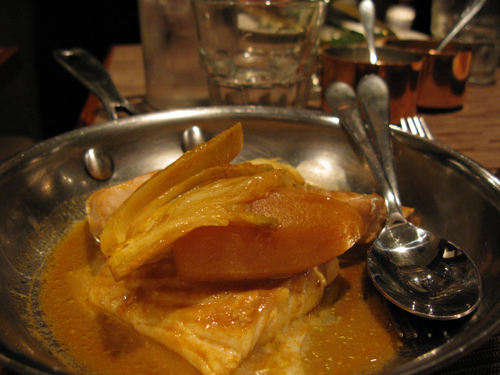 It was a bitterly cold December night, and there was nothing more satisfying than their Marseille-style Boullabaise which they served rustically in a large copper pan with the usual condiments of croutons and rouille sauce. The fennel, carrot and large, meaty fillets of fish (which I think was Hake) were braised to textbook perfection and the stunning saffron-flavoured fish stock had a sweetness and depth of flavour like no other. I haven’t had the chance to sample the real thing in the south of France yet, but I can’t imagine anything there being much better than this. If I had one gripe though, it was that the accompanying rouille sauce was much too garlick-y. Any more than a spot of it and it soon became rather overwhelming. Jo’s Cod dish came in a generously-sized portion. The large fillet allowed you to fully savour the moist, chunky flakes of cod meat. 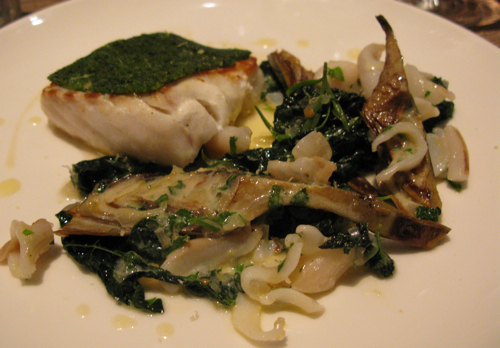 I found the unusual pairing with Razor clams and Grilled Artichokes particularly interesting. The smoky, nutty flavour of the artichokes and the natural sweetness of the razor clams gave the dish that added dimension of flavours and textures to lift it to that next level. On the whole, an original and extremely well-executed dish. 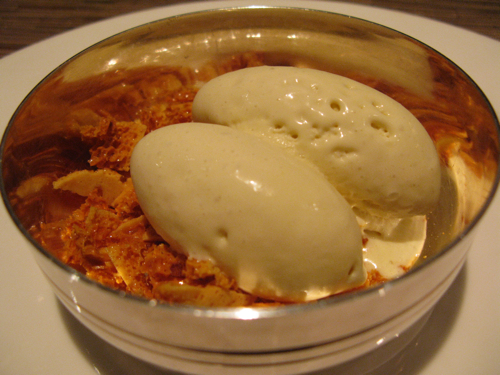 Wild Honey’s namesake ice-cream, served with crushed honey-comb was a simple but luxuriously creamy dessert which capped off a truly great meal. I thought the addition of honey to ice-cream would be sickly sweet, but they managed to keep the flavours just about subtle enough. There’s also something incredibly nostalgic about biting on pieces of honeycomb that takes me back to being a 7 year child all over again. With the damage for 2 people coming up to just under £90 (including 2 carafe’s of wine), this is some of the best value Michelin star food there is in the capital. I on one hand will most definitely be back. For me, it’s miles better than Arbutus and there’s still 10 other things on their menu screaming out to be tried. The food looks great – and as you rightly point out, not too pricey! Will be adding this to my list of “to dine in” places, thanks for the review! Suyin: It’s one of those places where everything on the menu sounds too good to be true. And i love the little carafes of wine they do as well! Lets you pair off each course with a 250m carafe. Let me know how it goes when you do get to dining here. You should’ve tried the tarte tatin! Best I’ve had in London imo. Nits: I recall seeing the Tarte Tatin on the Arbutus menu, but wasn’t actually on the Wild Honey menu that night we were there I don’t think. Will bear in mind for the next time we go back. Tho given their starters and mains tend to be very generous portions wise, imagine it will be quite hard to fit a big dessert!